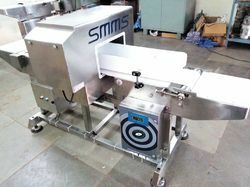 Packaging Metal Detectors are highly suitable for packed products application, these sturdy and robust design machine has a capacity to run on continuous production lines with minimum down time, Integrated with conveyor systems these machines can effectively detect and reject metal contaminated product with Minimum wastage of product. Metal Detector For Bottles is a quality product with robust design to detect metal contaminants in Pet Bottles, Metal detector can be installed after product filling line and before bottle caping line in case or foil caping. Bottle Metal Detector efficiently detects magnetic and non – magnetic and very high resistant Stainless Steel as well with minimum wastage of product, very high sensitivity and accurate detection gives our machines upper hand in market for most trusted brand. 5. Collection of rejected product in safe rejection bin for minimum spillage. 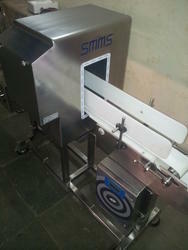 Ready To Eat Product Checking Metal Detector detect ferrous and non ferrous metals & Stainless Steel Metals. They come with a large digital display for clear and easy understanding for proper clarity of results. Highly used in Food & Biscuits industry, they are manufactured with high grade steel or non ferrous metals and studs. Flat panel detectors and high-density line-scan solid state detectors. various Models available as per the Industrial application. Aluminum Foil Packets Checking Metal Detector ferrous and non ferrous metals & Stainless Steel Metals. They come with a large digital display for clear and easy understanding for proper clarity of results. Highly used in Food & Biscuits industry, they are manufactured with high grade steel or non ferrous metals and studs. Flat panel detectors and high-density line-scan solid state detectors. various Models available as per the Industrial application. We supply Metal Detector for Aluminum Foil Products with best in class metal detection, Our Metal Detector accurately detects ferrous contamination in aluminum foil products, we have supplied our machines to large companies with satisfying results. Our Metal Detector is equipped with different types of rejection systems to reject the metal detected product. Equipped with rejection system such as flap type, Retracting type, drop down. Speed can be controlled as per various product lines. 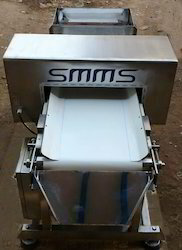 Metal Detector can be installed at final product line after packaging, Our Metal Detector for Packets checks with accuracy and speed any metal contaminants present in Food Packets, Dry Fruits Packets, Chocolate Packets, Aluminum Foil Packets, We provide different Models as per application to have best result and provide complete compliance as per food processing Industry Norms. Flame Proof Motor Panel Available for protection of conveyor. 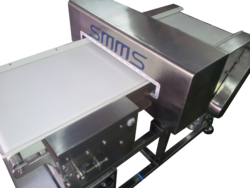 We manufacture Stand Metal Detector; this compact and sturdy machine is used for various applications in small scale food industry where there is a space constraint to in stall Metal Detector with Conveyor System. 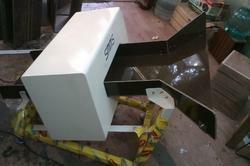 Our Stand Metal Detector is a state of art design, very compact and easy to move model. Can be used with stand, on metal detection will give audio/visual signal for accurate check. Metal contaminants detection in product packed in Aluminum Foil Packets in difficult, Our Aluminum Foils Checking Metal Detector detects metal contaminants in product packed in aluminum foil with accuracy and efficiency, we have Models for various product in under one compliance machine.